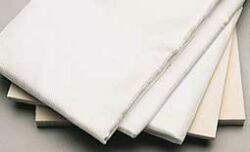 FEATURES: Fiberglass cloth is the highest quality, and the toughest weave fiberglass available. Made especially for use with polyester or epoxy resin. Excellent contouring qualities make it easy to apply to compound curves. This fiberglass cloth is paintable. REQUIRES: Polyester or Epoxy Resin to adhere cloth to model. Recommended for internal reinforcement. Strengthens firewalls and bulk heads. Can also be used in conjunction with glue to strengthen the glue joints for motor mounts. Excellent for laminating.